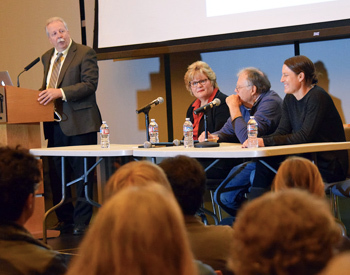 The Science Policy Fellows Program at the UC San Diego School of Global Policy and Strategy (GPS) hosted its annual roundtable discussion in collaboration with the Scripps Institution of Oceanography’s Science Policy Discussion Group on Dec. 8. 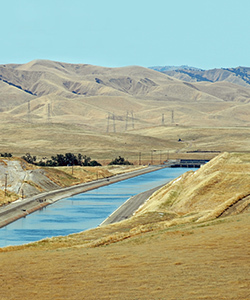 The event, titled “Water in the West,” explored sources of California’s water supply. 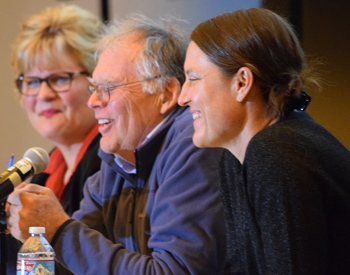 And though the four speakers approached the topic through different lenses—as scientists, policy experts and local officials—each held a steady gaze on the state’s past practices to forecast optimal regulations for future water use. Echoing Cayan, San Diego County Water Authority (SDCWA) Deputy General Manager Sandra Kerl honed in on the hindsight of the early 1990s, when the county relied almost solely on the Metropolitan Water District of Southern California for its water and faced a prospective 50 percent decrease in supply due to an impending drought. That concerning reality, Kerl said, led the SDCWA to take a “no regrets” approach to make San Diego County a self-sufficient water supplier and wean off of the metropolitan water district. To that end, SDCWA has invested $3.2 billion in San Diego County over the last 20 years toward conservation efforts,investing in infrastructure and diversifying its water resources. “Potable water use is 21 percent lower than what it was 25 years ago,” Kerl said, detailing that in 1990, San Diego County used 641,000 acre-feet of water. One acre-foot equals about 326,000 gallons and is the volume of water that would cover an acre of land to a depth of one foot. In 2015, the county consumed 570,000 acre-feet, she said. In 2016, SDCWA estimates only 41 percent of its water supply will come from the metropolitan water district and by 2025, only 13 percent will come from it. This is due in large part to the county’s Quantification Settlement Agreement, completed in 2003 with the Imperial Irrigation District, which grants up to 200,000 acre-feet of water to San Diego by 2021. The Imperial Irrigation District draws its water from the Colorado River. In addition, SDCWA has stewarded the re-alignment of the Coachella and All- American Canals and in 2014 conducted the world’s largest roller-compacted concrete dam raise in that of the San Vicente Dam to improve storage. As well, the Carlsbad Desalination Project now represents 10 percent of San Diego’s water supply, Kerl said. Tagging SDCWA the “poster child” for broadening water sources, Cayan also said another outlet worth investigating is atmospheric rivers—an area in which Marty Ralph, director of the Center for Western Weather and Water Extremes at Scripps Oceanography, specializes. In terms of their influence on the hydrology in the west, atmospheric rivers lend good and evil outcomes. “The punchline is atmospheric rivers can both cause floods and provide valuable water supply,” Ralph explained, noting about 40 percent to 50 percent of California’s annual precipitation falls from atmospheric river events. Ralph spoke in depth to the benefits of using atmospheric rivers forecasts—which translate to flood risks—to better inform reservoir operations. One of the challenges, he declared, is determining how much lead time is necessary to deem the forecasts useful. Ralph estimates five days of lead time would allow for enough water to be released from reservoirs and travel downstream from flood risk points, but it’s a topic his team is exploring more at Scripps Oceanography. Still, Ralph recognized, the science and engineering serving the rest of the U.S. is not fit for California’s climate because that, too, is different from the rest of the country. GPS Assistant Professor Jennifer Burney, who is also the faculty lead of the School’s Science Policy Fellow Program, chimed in that these factors also contribute to California’s dissimilar crop production from the rest of the nation. “If the Midwest and the High Plains are the bread basket, we’re more like the salad bowl and smoothie shop,” she jested. California, with $50 billion farm output, grows more than 350 different crops, Burney explained. In addition to growing most all of the country’s nuts, the state also produces about 60 percent of vegetables and 20 percent of milk in the U.S. The state’s vast microclimates are to thank for the multiplicity of high-value crops, Burney said. On the flipside, the hydraulic variability that comes with those microclimates does not benefit the crops’ need for a steady water supply. For perspective, 60 percent to 80 percent of California’s water supply is used for agriculture, Burney said. California also accounts for about 11 percent of the nation’s total water withdrawals and 20 percent of the country’s water withdrawals, via irrigation. From a policy viewpoint, Burney said, withdrawals from irrigation could be managed better if farmers were required to report groundwater pumping amounts to better estimate how to conserve for future water consumptions. Buney’s point fed into the main takeaway from the roundtable discussion, which Cayan underscored as follows.